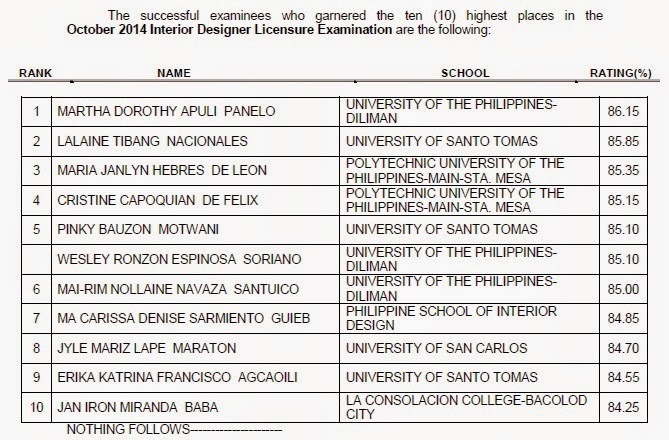 The Professional Regulation Commission (PRC) officially released the results of October 2014 Interior Designer Licensure Examination given by the Board of Interior Design in Manila. A total of 198 out of 331 examinees hurdled the exam. PRC named University of the Philippines (UP) - Diliman as the top performing school in the October 2014 Interior Designer Licensure Examination. UPD got 32 out of 32 or 100 percent passing rate.